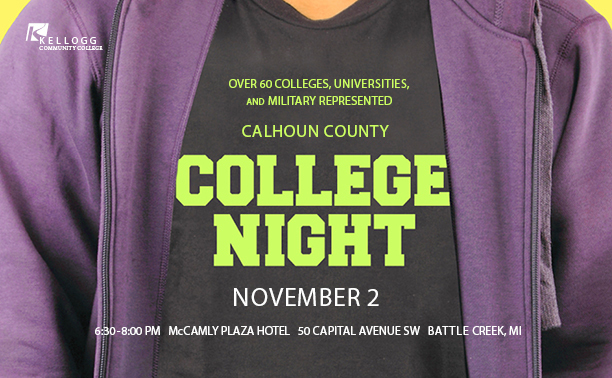 Future college students will have the opportunity to talk with representatives from more than 70 institutions and organizations during Kellogg Community College’s annual Calhoun County College Night, scheduled for 6:30 to 8 p.m. Monday, Nov. 2, at McCamly Plaza Hotel, 50 Capital Ave. SW, in Battle Creek. The event is sponsored by KCC and is free and open to the public. Meredith Stravers, director of Admissions at KCC, said most of the colleges to be represented are located in Michigan but the event also will include several out-of-state schools and representatives from various branches of the U.S. military. Financial aid information sessions will be held at 6:30 and 7:15 p.m. during the event. Stravers said students also will have the opportunity to meet with a number of organizations offering educational scholarships. The Kellogg Company group ¡HOLA! and the Burma Center will be providing interpreters throughout the evening, and free parking for the duration of the event will be available in the parking ramp attached to the hotel and Kellogg Arena. Calhoun County College Night follows KCC’s annual Transfer Fair for KCC students, which will run from 10:30 a.m. to 12:30 p.m. Monday, Nov. 2, in the Kellogg Room in the Student Center on campus at 450 North Ave., Battle Creek. Featuring admissions representatives from many four-year colleges and universities – including Grand Valley State University, Michigan State University, the University of Michigan, Western Michigan University and many others, in addition to U.S. military recruiters – the Transfer Fair is a great way for students graduating from KCC or planning to transfer their credits to gain valuable information about four-year institutions. Transfer Fair attendees will have the opportunity to learn about admission standards, application deadlines, scholarship opportunities and other important transfer information. For more information about Calhoun County College Night or the KCC Transfer Fair, contact the KCC Admissions Office at adm@kellogg.edu or 269-965-4153.